Warning: This post contains for spoilers for The Big Bang Theory 9×04. Do not read if you do not wish to be spoiled. Sheldon’s fear of abandonment reaches new heights in the fourth episode of The Big Bang Theory’s underwhelming ninth season. Somehow, despite the focal point being Sheldon’s unhappiness over how relationships in the group are changing, this episode proves to be lighter (and funnier) than the first three episodes. Please don’t consider that a glowing commendation, because last time I described watching episodes of TBBT as far more painful than waxing my face. I’ll break from tradition to discuss the good about this episode. Howard and Raj start a ‘filk’ band and write a song about Indiana Jones and Thor. It’s surprisingly entertaining and, as Stuart says, “sounds exactly like the sort of thing I don’t have to pay for”. (For those who don’t know, ‘filk’ is defined as “a musical culture, genre, and community tied to science fiction/fantasy fandom”). 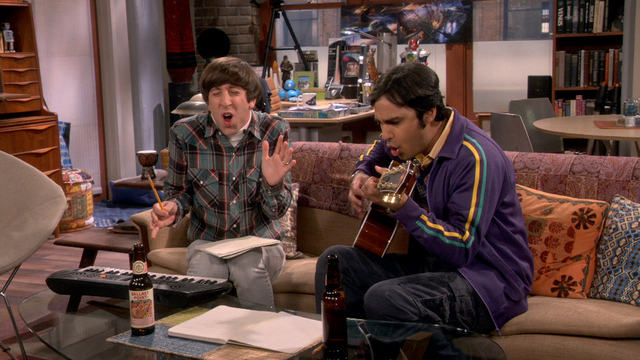 A highlight of the episode is definitely Howard and Raj’s five second band split, after Emily plays Yoko Ono and questions the music the boys are making. In other news, Emily is still around. I’m beginning to like her about as much as another Emily in another way-too-long sitcom. Meanwhile, Sheldon is upset to learn that now Leonard and Penny are married, Leonard is planning to move into Penny’s apartment. I know better than to question why Sheldon didn’t see this coming. To be fair, Lenny’s timing could be a little better. The news, coupled with Amy’s long-overdue dumping of Sheldon, causes Sheldon to freak out like it’s 2003. Deciding he was better off before the friends and feelings and wishy washy stuff, Sheldon recreates his old life and apartment of 2003 before Leonard moved in, and makes not nearly enough references to pop culture in 2003. I don’t know about anyone else, but I could have a whole episode on references to 2003 – the year of Buffy’s ending, the Matrix’s final venture and the film version of Lord of the Rings: Return of the King. There are some cute moments, like Leonard finding it difficult to sign his name to terminate the roommate agreement, and Leonard’s strained expression when Penny says they don’t have to eat Thai food on a Tuesday night. Then there’s Sheldon interviewing potential housemates. This definitely could have had more made of it, but the show suffers for being only 22 minutes long. He eventually comes to conclusion only Amy is qualified to be his roommate, an offer she quickly declines, despite her eagerness for the same scenario last season. I imagine she’ll change her mind before the season is through. The Big Bang Theory is nothing if not predictable. Another predictable and thoroughly irritating development is the lack of development. After witnessing Sheldon’s near break down, Penny and Leonard agree not to move in together after all, and instead sleep at both apartments as they have been doing for two seasons. Sheldon is happy. Yay for character development… not. Unfortunately, this episode is a flagrant demonstration of the BIG problem many long-running sitcoms suffer. All the characters are stuck in a nine-year mindset, and although the plot is screaming out for a move forward, nothing actually changes. What this series needs to learn to do is develop every character in a way that is still funny, and quickly. Preferably by episode five. The misery continues in brand new episodes of The Big Bang Theory, currently airing Monday nights on CBS in the US.